For sale, 18th and Mission. 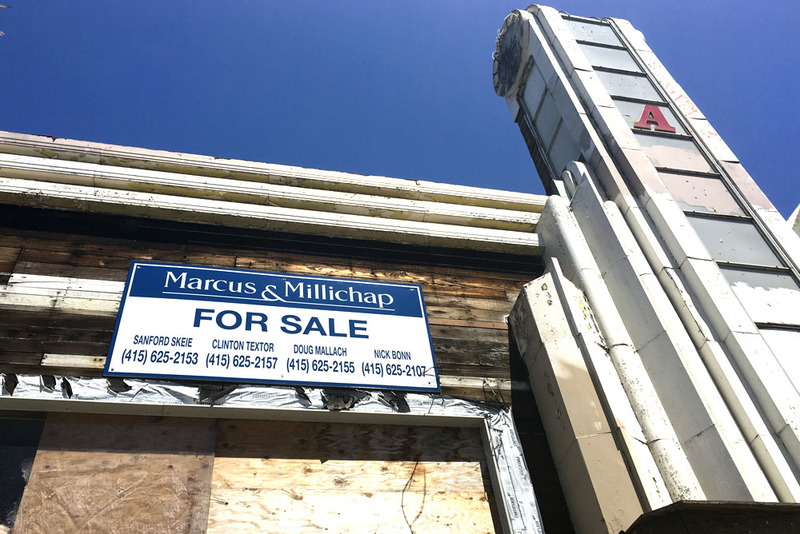 A historic and troubled property located at 2205 Mission Street at the intersection with 18th Street is for sale again after a deal with a commercial developer fell through. Its current owner, former Facebook executive Owen van Natta, is asking $7 million for the property according to the realtor for the property. He purchased it for $5 million in 2014. Clinton Textor, first vice president of investments for the San Francisco office of the realty firm Marcus & Millichap confirmed that the building is for sale. The property has a history on Mission Street that reaches back into San Francisco’s post-earthquake era and the development of the Mission Miracle Mile district that that bloomed during the depression. In April, a commercial developer had been in escrow to buy the property, planning to lease it to a dialysis clinic. It’s unclear why Meridian, the would-be developer, pulled out. Mike Conn, Senior Vice President of Construction and Development at Meridian Property Company would only confirm that they dropped out of escrow. “We will not be pursuing anything there. We don’t have any more involvement,” Conn said. Textor, who was not a part of the negotiations between Van Natta, Meridian and the city’s planning department, said the dialysis center could have faced some hurdles convincing neighbors it would be a good fit. “The tenant is going to want to see approved plans, and the community buy-in to whatever they’re doing,” he said. Van Natta’s project management team, which failed to pay for permits they filed and let plans lapse, had little connection to the community of merchants surrounding his would-be brewery. Speaking with Mission Local in April, the owner of a grocery store across the street from the building, Howard Ngo, said he hadn’t been able to get in touch with the owner of the decaying property. “I don’t know what’s happening over there. But it doesn’t look good,” he said then. The building has sat vacant for years. Before the dialysis center idea, other proposals for the space included a vegan restaurant, a brewery, and an organic grocery store. Instead the property sat neglected and complaints and violations accumulated. With a deal that would have restored the building but kept it structurally the same off the table, the property could feasibly be turned into housing. According to a planning department spokesperson, residential use is permitted with ground floor retail but any demolition or trying to add height to the building would be difficult to approve due to preservation concerns. There’s also the matter of frequent opposition to the construction of new market-rate housing on Mission Street, as well as planning department controls meant to curb gentrification in the neighborhood. “I think it’s going to take someone who’s really creative, and also very experienced and has a mindset that they’re going to work with the community to try to figure out something that makes sense,” Textor said. Textor estimated that anything new on the site would take about three years to complete, but was optimistic about the potential appeal of the building if it were to be renovated. Hat tip to Capp Street Crap for pointing out the “for sale” sign on the building. Wow, that’s some profit margin. Buy the building for 5M, neglect it for 2 years and then sell for 7M? This slumlord van Natta made out pretty well. What is wrong with Valencia street? At least it has commerce and activity instead of neglectfully decaying properties.